"Your vehicle was parked in the middle of the road and a PCN was issued for the contravention of being parked more than 50cm from the kerb. 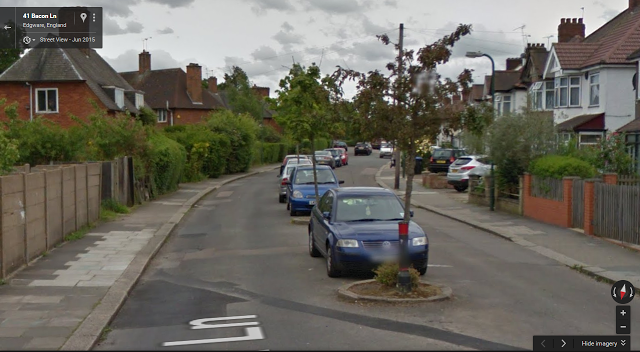 We recognise that Bacon Lane is an unusual location with trees situated in the middle of the carriageway meaning there is the potential for traffic to be obstructed when vehicles park next to the kerb. However, there is no formal exemption in place allowing vehicle sto park in the middle of the road, and no marking to suggest that they are permitted to do so. The Council is satisfied that the contravention did occur and the PCN was correctly issued." "You have stated in your correspondence that you and other residents have been parking in this way for a number of years now and no enforcement has previously taken place. I have accepted that this is indeed the case and therefore that you had a legitimate expectation to be able to carry on parking in this way having not received a PCN previously. For this reasdon, although I am satisfied the contravention did take place, I have cancelled the PCN issued to you." "The Parking manager has met with our Transportation department and they are going to undertake a review of Bacon Lane with the aim of formalising the parking arrangements for the benefit of residents and other motorists. We have temporarily suspended enforcement action in Bacon Lane against vehicles parked in the middle of the road while this review is undertaken." It appears that Brent Council has started issuing PCNs (Penalty Charge Notices) for vehicles parked along the centre of Bacon Lane. 'Mr Mustard' has written a summary on the issue. Please do not get caught out by this, and if you know anything about a PCN issue at this location please email Mr Mustard.